Are you a fan of stir-fried food? This recipe is somewhere between stir-fried vegetables and noodles. I first attempted this on the Christmas of last year. It came out perfect. And by perfect I mean everyone loved it (even those who don’t fancy pasta in general). But I felt there was something missing. Then a few weeks ago, I had purchased soy sauce and recreated the recipe. The soy sauce changed the overall quality of the dish. As much as this pasta is stir-fried, I justify it with adding plenty of vegetables ha! This pasta dish works great as a main dish and as of right now, I have made it more than three times in a span of just two weeks. It’s that good! Break the pasta sticks into three equal parts. Fill a medium-sized pan with water and let it reach boiling point. Remove lid from the pan and add the pasta. Sprinkle a little salt in the pasta while it cooks and make sure to stir occasionally to avoid clamping of the pasta strands. After 5-7 minutes, drain the pasta, wash with cold water and set aside. Over high heat, pour oil in a larger pan and let it cook for one minute. Add ginger and let it saute for one minute while stirring. Next add salt, and then the pasta. Keep stirring the pasta using a fork and a wooden spoon (mingling stick). After two minutes, add the onions and stir till they are evenly distributed in the pasta for two minutes. Add the green pepper and the carrots while distributing them evenly in the pasta. In a separate bowl, add the soy sauce and dilute it with 6 tablespoons of water and mix well. 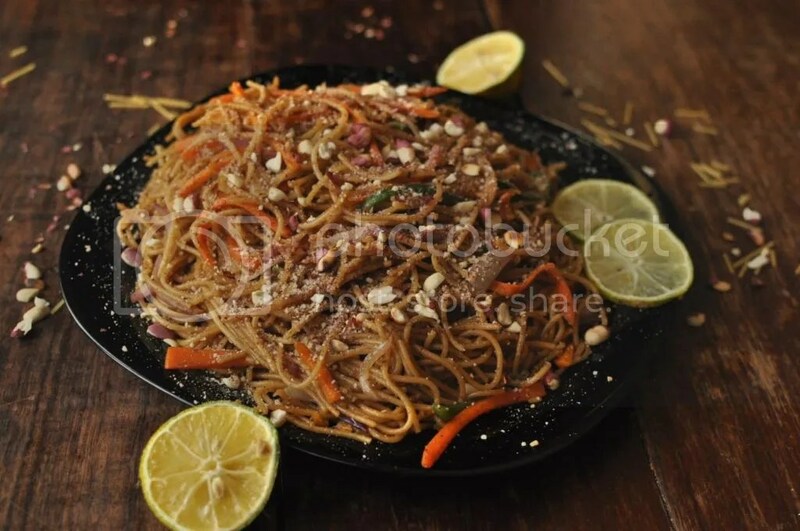 Sprinkle the soy mixture in the pasta while stirring till also even distributed. Keep adding the soy sauce till it is over while constantly mixing. Make sure it does not burn. Remove from fire. Coarsely crush the groundnuts (either in a grinder or manually with a glass) and sprinkle them on top of the pasta. Squeeze the lemon over the pasta (make sure the seeds are sieved). Serve Hot. 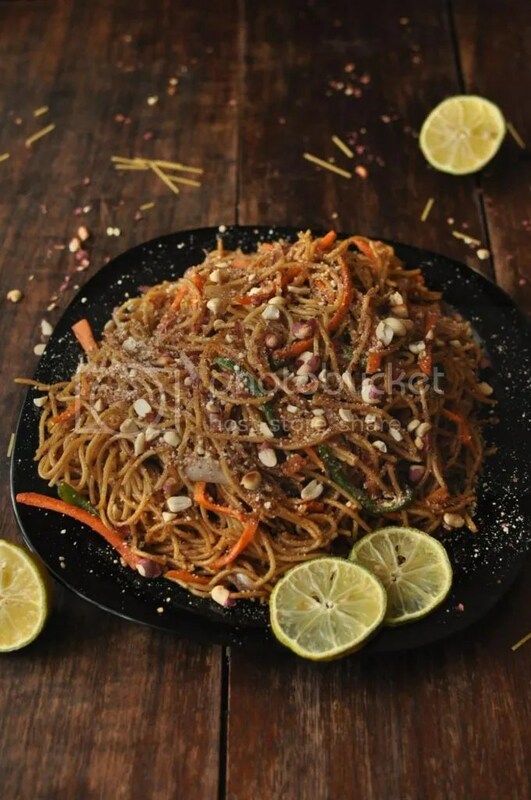 PPS: If you don’t like the crunchy texture of the groundnuts, you can finely grind them and add them in the pasta while it is still cooking, right before it is removed from fire, to achieve an overall nutty taste.